Putting an End to Carding: What's Next? May photo by Joyita Sengupta. Mayor John Tory’s vow to seek a “permanent end” to carding was a turning point in the long-fought battle against the controversial police practice. But nothing’s over just yet for the contentious police tool. Carding is described by critics as racist, and the practice has been found to disproportionately target people of colour. While carding was officially suspended in January, it will take much more to eliminate the practice. We take a look at what the process might look like, who is involved, and what some of the challenges may be. What are the immediate steps to put an end to carding? Mayor Tory said he will ask to put an end to carding at Thursday’s Toronto Police Services board meeting. He has proposed motions to do so. Motions 6d and 6e may prove controversial, as those two items ask for reports on the feasibility of preserving collected carding information, with an independent body safeguarding the information. Community groups and activists will likely object to this on the grounds that unconstitutionally collected and discriminatory data still represents a civil rights violation, even in the hands of a third party. For a motion to pass, there must be a majority vote among the seven members of the board. Along with Mayor Tory, the six other members of the board are: Board Chair Alok Mukherjee, Dhun Noria, Andrew Pringle, Marie Moliner, Councillor Chin Lee (Ward 41, Scarborough-Rouge River), and Councillor Shelley Carroll (Ward 33, Don Valley East). As it stands, it looks like Tory, Carroll, Moliner, and Mukherjee at the very least would vote to put an end to carding, although the details of what votes might look like on specific motions remain unclear. In early June, before Tory came out against carding, Mukherjee wrote a column in the Toronto Star calling for the force to stop keeping information obtained from carding in searchable police databases. However, the article is careful not to condemn the practice of carding itself, saying that such notes should be kept in officer “memo books” rather than a database. Around the same time, Cllr. Carroll released a statement on her website saying that based on the evidence she has seen and response from the community, she would like to see a change in policy in regards to carding. As for Noria, Pringle, and Cllr. Lee, they all voted in favour of a revised carding policy in April despite facing opposition from community groups the African Canadian Legal Clinic and 10 councillors. That policy still allows police to card people, but, if asked, officers are required to tell citizens why they are being stopped and confirm that they are free to go. Also, officers are to hand out business cards in order to identify themselves rather than a carbon copy receipt of the information collected. Carroll and Moliner both voted against the proposed revision. An added wrinkle in the current board dynamic is this morning’s report that Pringle may imminently replace Mukherjee as chair of the police board, possibly as soon as Wednesday. Pringle is close to the mayor—he served as his chief of staff when Tory was the leader of the provincial Conservatives. He is also seen as more sympathetic to police chief Mark Saunders’s stance on carding. But what about the force? The board must consult with the Chief of Police before determining any policies. Chief Mark Saunders has said he is against banning carding, and claims that the practice helps keep communities safe. However, Toronto Police Services has never presented any formal reports or evidence to support carding as a means for reducing and preventing crime. On the contrary, the 2013 Police and Community Engagement Review, better known as the Pacer Report (to which then-Deputy Chief Saunders contributed), reported that there was long-standing concern in the community about police disproportionately carding racialized people, and that the interactions were repeatedly described as “intimidating and disrespectful” during community consultation sessions. To deal with this, the report recommends the creation of a standing community advisory committee to address the issue of racial profiling and pursue bias-free policing as well as community surveys administered by the Service to gauge public trust and concerns. What about on a province-wide level? The provincial government finally jumped into the conversation this week when Community Safety Minister Yasir Naqvi announced plans to try and standardize the way police checks are done. They’re going to base regulations on the Charter of Rights and Freedoms as well as consultations with various community groups in the coming months. NDP MPP Jagmeet Singh says he has been carded before and wants an outright ban of the practice, saying it is not something that can be regulated. Carding exists in other Ontario municipalities, like Ottawa, Durham, Hamilton, Windsor, and Peel region but is usually referred to as “street checks.” Similarly, communities in all those regions have pushed back against the practice. The practice is currently under review by the Peel Police Service. This comes after Brampton Mayor Linda Jeffrey and Mississauga Mayor Bonnie Crombie, both members of the Peel Police Service Board, put forth a motion challenging the practice’s constitutionality. Ottawa police are also conducting an internal review into how street checks are conducted by the force, and what guidelines they should implement. In Windsor, police chief Al Frederick denies their street checks are random or arbitrary, and argues they are a “critical” police tool. In Hamilton, Mayor Fred Eisenberger said he believes carding or street checks are not an issue in his city despite growing protest over the last year. Activists in the city plan to raise questions about the police practice at the June 25 Police Board meeting. Finally, what are we hearing from communities now? 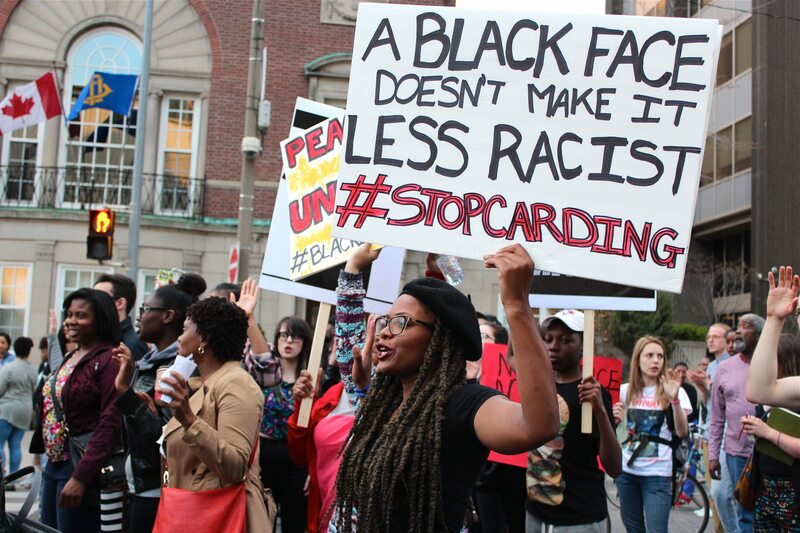 The progress against carding thus far is a direct result of the work of several community activists and organizations, and the pressure they have put on governing bodies and police forces to help put an end to carding. Knia Singh, an Osgoode Hall law student, filed a Charter challenge against carding last week after having been carded several times himself. Along with many others, he says that not only should the practice be stopped, but the entire database of information collected from carding should be wiped clean. After requesting access to his own records through a freedom of information request, he was shocked to find to not only find several descriptions of his appearance and what he was wearing, and an account that questioned his immigration status although Singh was born in Canada. Anthony Morgan of the African Canadian Legal Clinic has been vocal in the conversation against carding in Toronto, but points out that the experience of police discrimination is neither limited to Toronto or the black community. He says he would like to see reconsideration of police street checks in Quebec as well and that across the country Aboriginal people are likely be targeted by police as well.